We got these Zelda tattoos a few days after the 25 anniversary of Zelda. It was very out of the blue and we did it within 10 minutes of talking about it. The artist looked at us like we were crazy, but both of us are really satisfied with out tattoos. Autumn has the life hearts on her foot and Moses has Link on his wrist. Both done at New Addiction Tattoo in Calhoun, GA.
Posted in Legend of Zelda, Tattoos, Video Games. 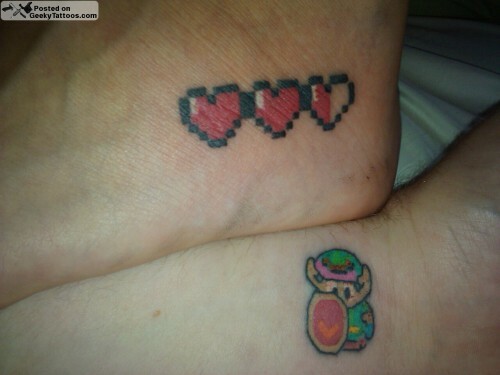 Tagged with foot, hearts, Legend of Zelda, Link, New Addiction Tattoo, wrist.